I am a busy mom so easy, healthy, reheatable meals are very important to me. And after eating salads for two years, I need something new to get excited about in the kitchen. This first one comes to you from one of my favorite food blogs 100daysofrealfood.com – Homemade Chicken Noodle Soup. I bought her latest book and kind of went to town. Read the first half about how to shop and what to look for regarding ingredients, etc. This one is good because the kiddo can help by peeling carrots (doesnt he look thrilled) or measuring chicken stock and then you just throw it all in and let it cook. Easy. 1. Heat a little bit (2 TBSP) of EVOO in a large pan. Throw in one of those bags of veggies from the produce department at your local grocery store that says “stir fry”. 2. Cook by stirring constantly on med-high heat for about 5 minutes or until the desired tenderness. I like mine a little crunchy. 3. Scoot the veggies over to one half of the pan and drop in about 10 uncooked, thawed medium shrimp and saute those until just pink. 4. 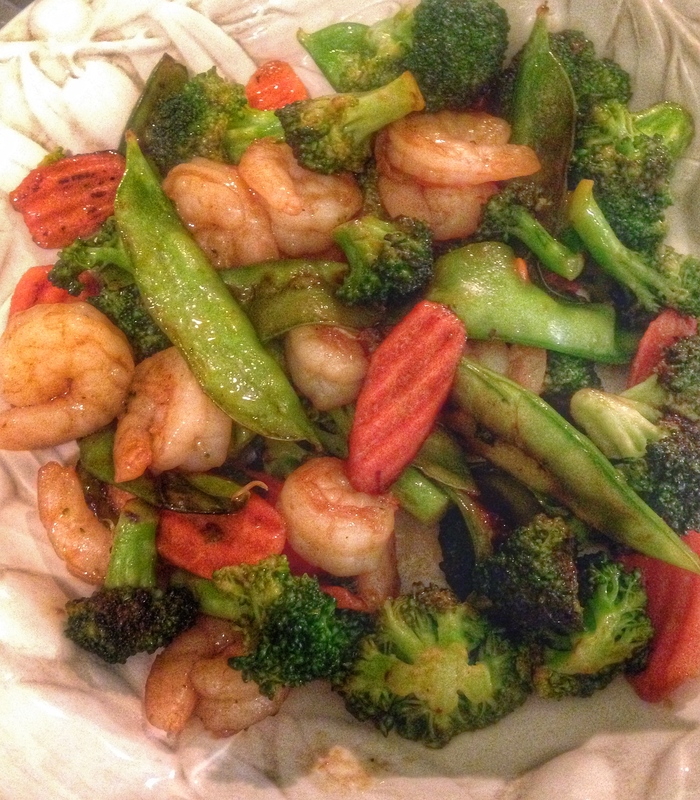 Drizzle stir fry sauce over both the veggies and the shrimp and stir to combine. Turn off the heat. What do you cook to get out of the salad rut? This entry was tagged cooking with kids, food, healthy eating, healthy-living, recipes. Bookmark the permalink.